This short tutorial assumes that you know the basics of using the media browser, the timeline, and the inspectors. If you need more information on those items, watch our introductory tutorial. Launch Photo to Movie 5 and drop a set of photos from the media browser into your timeline. Click on the track selector at the far left of the timeline. Using the inspector, change to the Layout tab and set the Layout to Collage. Change to the Frame tab and click the 5% button. 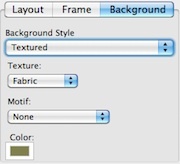 Change to the Background tab and set the background to Textured. Adjust the color if desired. Select all of your photos in the timeline by clicking one and then using Edit > Select All. Using the inspector again, switch to the Effects tab. Twist down the Border section and set the Border Size to Thin and the Color to white. Twist down the Shadow section and set the Intensity to 50. 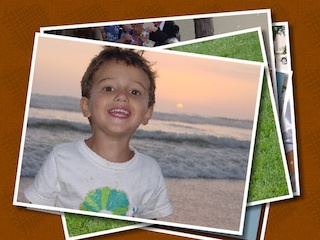 This short tutorial gives you a quick way to make great looking slide shows with Photo to Movie. By experimenting with other options that you encountered during this tutorial, you can accomplish similar high quality effects.